How Long Does It Take Before a Body Starts to Lose Weight? You're committed to eating a healthy, portion-controlled meal plan and you vow to get to the gym several times a week. You want to see and feel the results of your efforts pronto. When you cut calories, your body begins to burn small amounts of fat. How soon you'll notice that weight loss depends on how much weight you need to lose and on the rate at which you're losing it. A safe, sustainable rate of losing weight is about 1 to 2 pounds a week. When you eat fewer calories than your body needs, your body will burn fat to make up the difference -- and gradually, you'll lose weight. One pound of body fat equals about 3,500 calories. So, over seven days, a deficit of 500 to 1,000 calories a day yields a weight loss of about 1 to 2 pounds a week. When you cut too many calories, however, the body senses a potential famine and tries to conserve your fat stores. As a woman, if you eat fewer than 1,200 calories a day, or as a man, if you eat fewer than 1,800 calories, your body may break down your muscle tissue to use for energy. The scale will show you've lost weight but this loss will be, in part, a loss of muscle mass, which alters your overall body composition -- your ratio of fat to lean mass -- in an unfavorable way. Your dietary goal is to reduce your caloric intake so your body will burn fat, but not so much that you fall below the minimum caloric intake of 1,200 or 1,800 calories a day. It's natural to want to see physical changes quickly, but transitioning to slimmer hips and stomach takes time. Even though you might not see results quickly, your fat-loss efforts are doing you a world of good. Dropping as little as 5 to 10 percent of your total body weight can noticeably improve blood pressure, cholesterol and blood sugar levels, states the Centers for Disease Control and Prevention. If you weigh 200 pounds, that's a loss of only 10 pounds -- an amount that may not transform how you look but could profoundly affect your health. If you start exercising as part of your weight-loss program, you'll significantly reduce your risk of heart disease, even if you don't lose a lot of weight. Eating healthier and moving more also helps you reduce visceral fat. Visceral fat is the deep belly fat surrounding your internal organs and it greatly increases your risk of health complications like type 2 diabetes and cardiovascular disease. If you reduce that visceral fat by 10 to 20 percent, you may not see substantial changes on the scale, but your efforts will have a positive impact on your health. You may see signs of weight loss before your friends, co-workers or family see them. 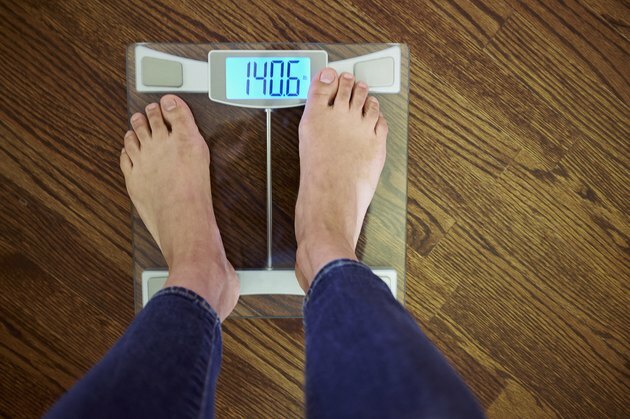 Your belt fits a little more loosely, the scale shows that you've lost a pound or two -- and when you look in the mirror, your arms and thighs look slightly slimmer. These changes only become evident to others if you lose a significant amount of weight, which depends on your starting weight. For example, 10 pounds lost on a 130-pound person is more noticeable than a 10-pound loss on a 250-pound body. If you're overweight, any weight loss is a positive thing. You may become frustrated, though, when you don't see a loss in your "trouble" spots. Unfortunately, it isn't possible to spot reduce; you lose and gain weight throughout your body. Often, weight loss occurs last in the areas where you first noticed weight gain. For men, the belly tends to be a common fat storage depot while women often struggle with heaviness in the hips and thighs. Although you want quick weight-loss results, trying to lose weight too quickly is often unhealthy and counterproductive. Fad diets or quick weight-loss schemes may help you lose weight in the short term, but they often lead to a quick re-gain of all the weight you lost. Focus on making broad sustainable changes in your diet and exercise habits so you can keep weight off over a long period of time. Slowly phase out processed foods, fast foods and frequent sweet treats. Cook more of your meals at home and use fresh ingredients, such as watery, fibrous vegetables, lean proteins, fruit, low-fat dairy and whole grains. Count calories or use your plate as a guide for healthy, portion-controlled eating. Fill one-quarter of your plate with a grilled, roasted or broiled protein; fill the second quarter with a quality carbohydrate such as a starchy vegetable or whole grain, and pile on the vegetables on remaining two quarters of your plate. A meal might include grilled chicken with a sweet potato and green salad or a turkey breast sandwich with carrot and celery sticks. Stay away from chips, sweets and soda at snack time. Instead, choose low-fat yogurt, fresh fruit, unsalted nuts or low-fat cheese. Exercise helps you burn calories and enhances the health effects of weight loss. Try to get at least 150 minutes a week of moderate-intensity exercise. To lose a significant amount of weight, get more than 250 minutes a week, recommends the American College of Sports Medicine. Add resistance training to make your results visible more quickly and so you will have a tighter physique. Doing as few as two sessions a week that target every major muscle group, with at least one set of eight to 12 repetitions, will suffice, especially in the beginning. If you want to experience greater muscle-building and physique-changing results, progress to heavier weights, a greater number of sets and additional weekly workouts. If you're not sure how to begin an exercise program, consult a fitness professional. How Soon Can I See Results From Using a Treadmill?